Scotrenewables Tidal Power is in the closing stages of construction of the largest and most powerful tidal turbine ever built. The turbine is currently being assembled at the Harland & Wolff shipyard in Belfast, with installation planned for this summer at the EMEC test site at the Falls of Warness, off Eday. 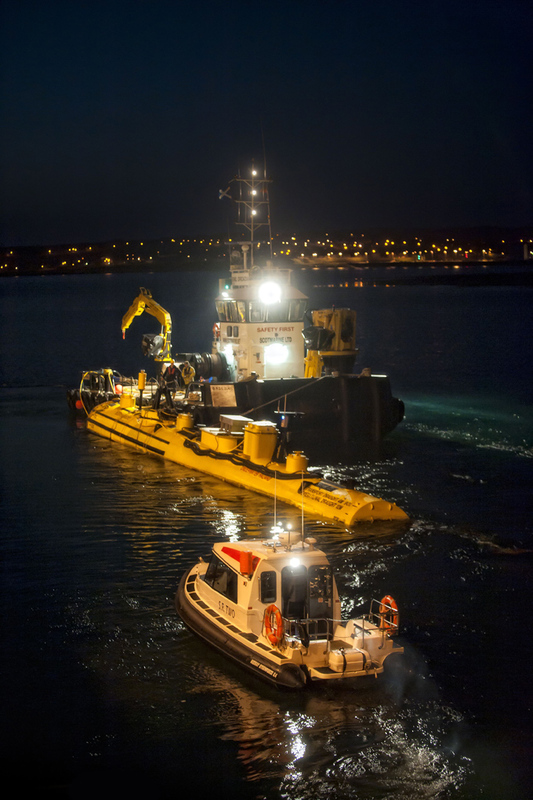 The Orkney-based company’s turbine – known as the SR2000 Commercial Demonstrator – will generate 2 MW of electricity from a tidal current of 3 metres per second. It has been optimised to maximise energy generation at the EMEC site. The turbine will incorporate two rotors, each 16 metres in diameter, mounted on the 64-metre hull. The rotors are retractable, allowing the transport draught of the device to be reduced to 6 metres for towing to and from the site. The overall device weighs approximately 500 tonnes. Scotrenewables was formed in 2002 by Barry Johnston with an Enterprise Fellowship from the Royal Society of Edinburgh. With a degree in offshore engineering from Heriot-Watt University, he sought to apply his experience on and off-shore to develop a concept for a new design of tidal turbine. His aim was to produce a design that would prove both cost-effective and robust, to cope with the conditions of the world’s harshest tidal races – such as the Pentland Firth. He saw from the outset what the greatest challenge would be – to find a cost-effective way to install and maintain a turbine at sea. His solution was a floating turbine. It could be installed using only small, low-cost vessels, and with the electrical generation equipment above the surface of the sea, it could be readily accessed and maintained. 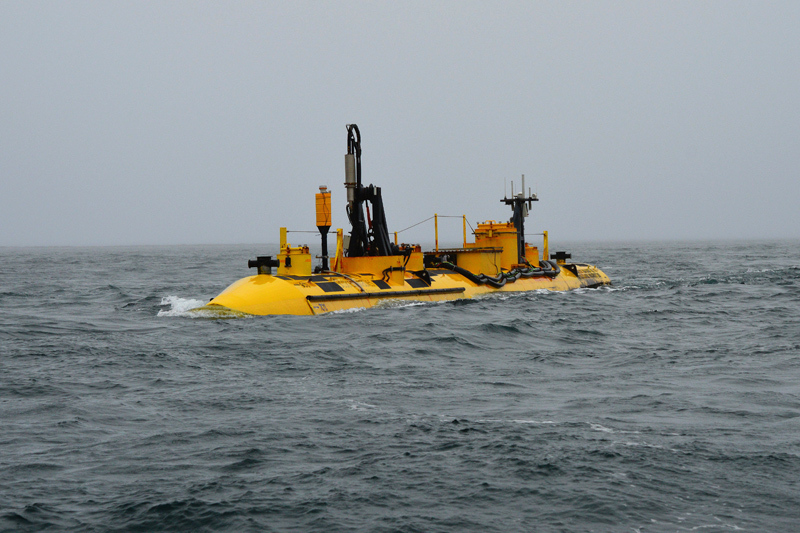 Also, with the tidal flow much stronger near the surface, a floating turbine would be able to generate more energy – up to twice as much as one mounted on the sea-bed. Scotrenewables embarked on a long period of proof-of-concept testing, with backing in the early years of development from the Scottish Government and Scottish Enterprise. As the potential of the design became confirmed, international investment came in – from the French oil and gas group TOTAL, from the Fred. Olsen Group in Norway, and from ABB Technology Ventures in Switzerland. The company now has one of the strongest investment partnerships in the marine renewables sector. It has expanded from a two-man team to over 20 staff members including design engineers, electrical engineers and hydrodynamicists, along with specialists in offshore operations, environmental aspects and consents, health and safety, and business development. In the development of the new turbine, SRTP is following the same design philosophy that was successfully demonstrated with the SR250 prototype that was tested at EMEC from 2011 and 2013. The turbine will be towed from Northern Ireland along the west coast of Scotland and is planned to arrive in Orkney in June. Initially the turbine will be subject to tow, handling and mooring connection trials. Turbine installation at EMEC’s Falls of Warness test site and grid connected power generation is planned before the end of the year. All installation, operation and maintenance operations will be carried out with a single multicat workboat vessel. Furthermore, the design seeks to minimise the use of non-standard components to reduce cost and maximise reliability. SRTP is planning a two to four year demonstration programme for the 2 MW turbine, focused on maximising reliability and testing ongoing cost-reduction strategies. 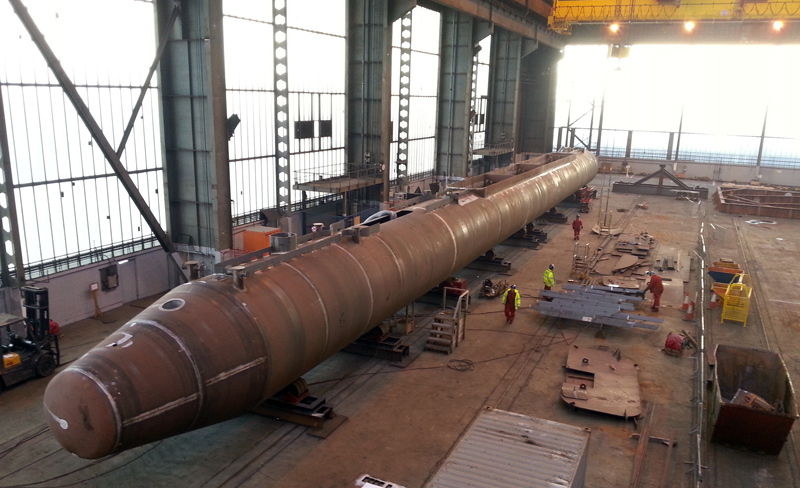 Construction and assembly work of the turbine has been focused around two locations – Harland and Wolff in Belfast, where the superstructure is being assembled, and the company’s new assembly facility at Hatston Pier where the turbines internal systems have been assembled and tested. 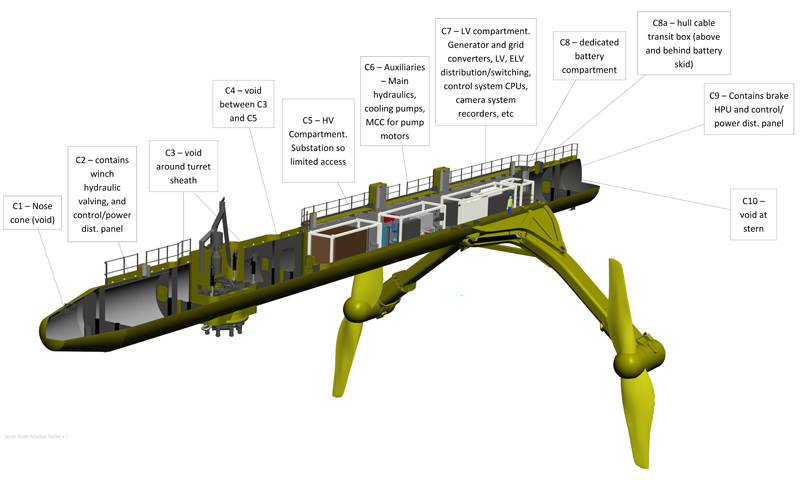 SRTP envisages that this new facility will continue to be the main assembly point for future turbine orders from the UK tidal market. The company is currently in talks regarding supply to several projects. James Murray is the business development manager for Scotrenewables Tidal Power, liaising with customers, utilities and government agencies to identify and follow up new market opportunities for the company. He has a degree in electronic engineering from Waterford Institute of Technology and a Master’s in renewable energy systems from Loughborough University. Originally from Waterford in the Republic of Ireland, he has lived in Scotland for several years, first working in wind energy and later in marine. He is passionate about driving marine energy to full commercialisation.